I'm a mom of 6, and while we travel often it's always loaded to the hilt in a suburban - not jet setting, only-what-you-can-carry type travel. This year I'm going on a dream trip with my husband; we'll be visiting Romania and Italy over 3 weeks and won't stay in any one place longer than 3 or 4 nights. We'll be traveling by plane, train and taxi so I want to be able to move easily and simply. I'm planning to take my A45 and S19 and not check any bags. The S19 just came today (and I love it!!! ) so I haven't figured out the best packing configuration yet, but I did a packing trial run this evening. Everything fits but it feels a little clunky. So what are your favorite hacks and organizational tips - especially for carry on only flights? I have several packing cubes and stuff sacks, and am planning to take a MCB for EDC after arrival. Also, I'm a knitter so any advice regarding flying and knitting is welcome and appreciated, too. Is this trip with the six kids?! No, just my husband and me! Do you plan on hand or shoulder carrying the A45 and then wearing the S19...? Is the combo for you alone or can fit both you & your hubby's stuff? YMMV, but I've found that when trekking through airports, planes, trains, automobiles, etc., it's easier for me to put the heaviest item on my back (usu the A30) and then hand carry a tote of some sort for under the plane seat, etc. I find that the zip top shop bags are very useful for this, as are the co-pilot, pilot, etc. I pack a small cross body bag (SK, DLBC, TC, etc) or the DLBP for EDC at the destination. These two bags are just for me. Hubby will already be there for work so I'll meet him there. I'll probably carry the A45 on my back and hand carry the S19. 2. Don't pack anything you can't wear with everything else. Basically, pack one outfit with six layers, then break it up. If your husband doesn't know how to hand wash clothes, teach him, and share the job of keeping skivvies clean. 3. If you can reduce your load to just the A45, including packing the S19 inside it as a day bag, you will be so glad. It feels so FREE to walk through the train station with nothing in your hands, no kids to track. It's like coming up for air after a deep dive. I totally understand and appreciate the enabling... The reason is simply that the S19 has been the bag on my wishlist for ages and will be used more than a tote in general. I have to build my collection slowly so my husband doesn't have a heart attack. Thank you - great tips! I love my kids but I'm SO excited about this getaway! I realize this is a very old OP, but since this thread has bubbled to the top, I figured I'd add my 2¢ (or 1.42¢ USD with the exchange rate) for new people looking for tips on travelling lighter and getting down to one bagging. Still good ideas, for tweaking how to further lighten an already lighter load. But a lot of people miss the big picture, looking at the heavy items first. I find it amusing when I see colleagues who are proud about the 3 oz they saved by not carrying an extra pair of socks, but still carry around a 2 lb DSLR on all their work trips where we're either in the office, a hotel or a restaurant and doing absolutely no site-seeing "just in case they want a good photo". Or the people who insist they need their over-ear noise cancelling headphones, on a 45 minute flight. At one point, I was on a project with a colleague who carried 3 laptops, our client issued one, our corporate issued one, and personal one. And this was back when laptops were still closer to that 5 lbs mark than the ultrabooks we have today. Factor in that his personal laptop was a 10 lb alienware, that was 20 lbs he carried around just in laptops. In comparison, I carried the same client laptop, and an iPad 2. So, maybe 6 lbs. Opps, there I go again, off reminiscing instead of sticking to the point I was trying to make. The point is, don't focus so much on the clothes first. Instead get rid of the stuff you don't need to take with you. 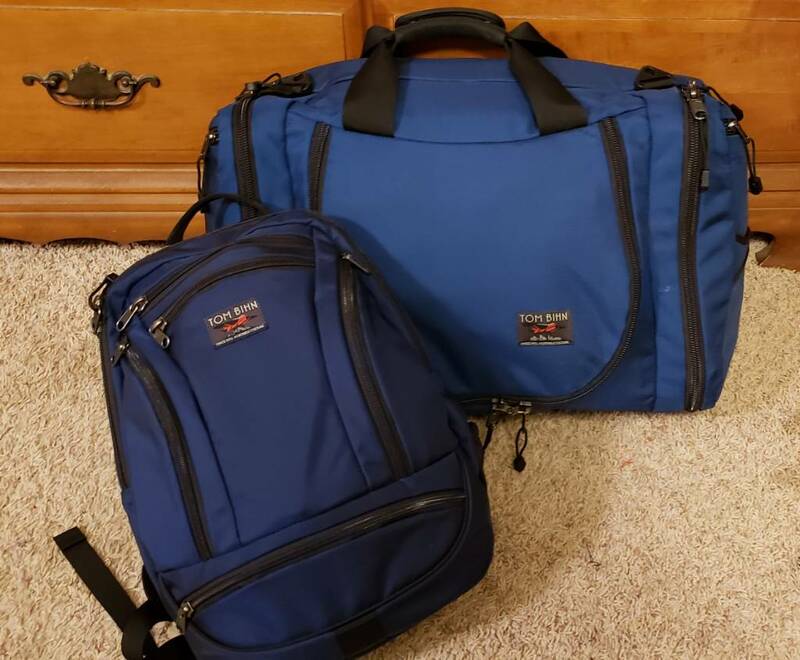 Over the years, I've learned how to bring less, which is what let me pack for a 5 day conference, plus bring my toiletries along, all in my old Swiss Gear backpack. And I never spent a dime on 'lightweight' or 'travel' clothing. I did it all, based solely on not bringing the stuff I don't need to bring. That's it, because that was all I really needed to bring. And I didn't sacrifice on my clothing, or have to do wash, or anything like that. I was still able to change my shirt, socks and underwear each day, and my pants every other day. All I really did was not bring anything extra. Camera was left at home, used the iPhone's. Book? iPhone. e-reader? iPhone. Noise cancelling headphones? turn up the earbuds. HDMI Cable? watch movie directly off iPad. Separate chargers? iPad charged during day, iPhone at night, watch while getting ready in the morning. Sunglasses? conference was indoors. Mouse? laptop's trackpad. So the point is, lighten the load first. Then, when you're already travelling light, you can lighten it even further by looking at lightweight bags, lightweight clothing and versatile, multi-use Thneeds. In your particular case, I’d be recommending looking at what you’re bringing, and the likelihood that you’d actually need it. Then see if you can get your packing down to just the A45. If you can, then you can congratulate yourself by allowing yourself the extra room of your crossbody bag. I know you’re looking to justify your S19 purchase with this trip, but I wouldn’t let that drive me to the point of having to hand carry anything. As was stated earlier, being able to swing through airports, train stations and what not hands free is very liberating. Understandable. I have an S19 I use for work and I love it so much. If I travelled with a roller bag, I'd def use the S19 as my personal item. But I travel with an A30, and discovered I rarely need a second bag -- I can usually even fit my day bag in it. If the A30 isn't enough space, my second bag is a tote or (even better) crossbody. The mom instinct is to be prepared for anything at all times, so you'll be amazed when it's just grown ups, how little you need to take care of yourselves. So I recommend you only bring bare minimum, then fill up the A45 with whatever extras you buy and presents for the kids, and on the way home check the A45 and use the S19 as your carry on. You'll discover just what your minimal needs are (and what you def need next time) AND demonstrate how necessary the S19 is! Sounds like a great trip! What's in your bags for the trial run packing? Is it your final list or are you willing to cut some things out? I may have missed it, but what time of year are you going? I'm going in the winter, and am definitely ok with cutting some things out from my trial run. I'm trying to make a complete list as I play around when the configuration. I've been known to put the S19 on the front and the A45 on my back when I want two free hands, like going down stairs and escalators. It is more balalanced and I can move faster. I have a messed up right shoulder, and my back isn't that great. It actually feels better with the A45 on it, fully loaded. If planning on touring churches, you will need head & shoulder covering and some even want knees, male and female covered as well. Pay close attention to weight and size requirements for bags, as they will likely check.